This week, Daniel and I celebrated our second wedding anniversary in the beautiful town of Carmel. This oceanside gem may well be the most beautiful place I have ever been. To put that in perspective, I have been to Jamaica and Hawaii, Yosemite and Sequoia National Parks, the Grand Canyon, Egypt, Paris, Greek Islands, Cinque Terra, and basically everywhere in California. But Carmel just has something the equal of which I have never seen. Between the ocean, the cypress trees, and the gorgeous coastline, Carmel exudes natural beauty, and it’s houses and downtown area are adorable without taking away from the beauty that’s already there. Carmel also has much to offer in the food and wine areas, and I try to visit whenever I head down to the Monterey area. 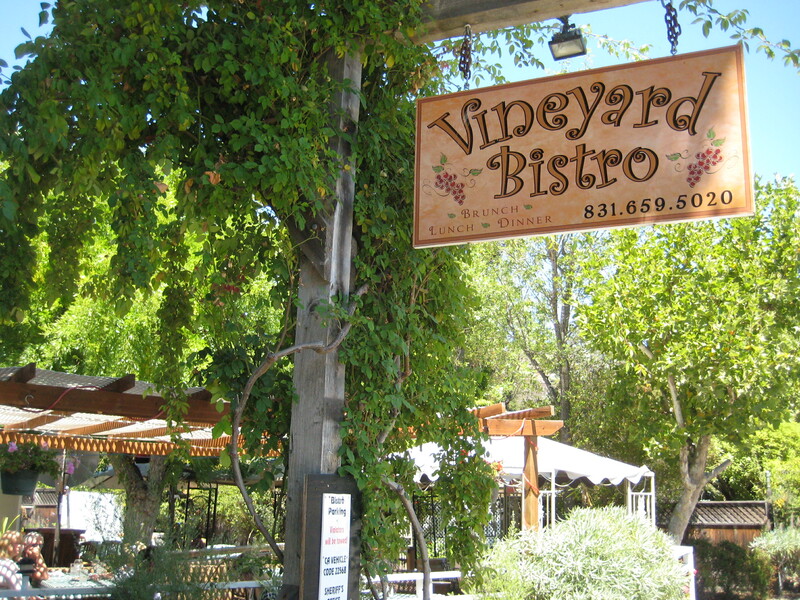 We began in Carmel Valley with a fabulous lunch at the Vineyard Bistro. It was adorable! We sat outside, surrounded by trees, my skin baking in the sun. I had the most amazing tortellini in gorgonzola cream sauce. It was rich and flavorful without being overpowering, and I am quite sure my arteries were in danger of bursting afterward, but I didn’t care because it was SO GOOD. It was a really nice place to sit and enjoy each other’s company, lazing about in the sun. We couldn’t very well visit Carmel Valley without tasting some wine, so we wandered over to Chateau Sinnet‘s tasting room nearby. Having done very minimal research ahead of time, I had seen their tasting flight contained 7 wines for $7 which is a pretty good deal, so we went for it. Apparently, we should have looked around a bit more. The wine was perfectly decent. The White Merlot was unique and tasty, and if we didn’t already have a ton of wine at home, I might have bought a bottle. We both enjoyed the Cabernet Franc and the Late Harvest Zinfandel as well, and the prices were really reasonable. The Tasting Room Manager who was anything but. We agreed after that he was the worst pourer either of us had ever had. Usually, pourers are either relatively reserved, giving you the chance to concentrate on the wine, or they try to engage you in conversation, about the wine, your day, or whatever else they can think of. In my experience, the best pourers are friendly and chatty, know a lot about their wines, and are eager to share the information without pushing it. This guy was just about the opposite. He was disengaged, talking super fast but monotone as if he were reading from a script. And he pushed the hard sale which is just stupid when you’re talking about wine. No one wants that, and we may actually have bought a bottle if he had just shut up. As it was, we were both ready to get out of there as quickly as possible to the point of leaving before we had finished our last taste. We practically ran to the car once we got out the door. Suffice it to say, I will not be going back. And then we entered nirvana. The main event of our trip was Refuge. 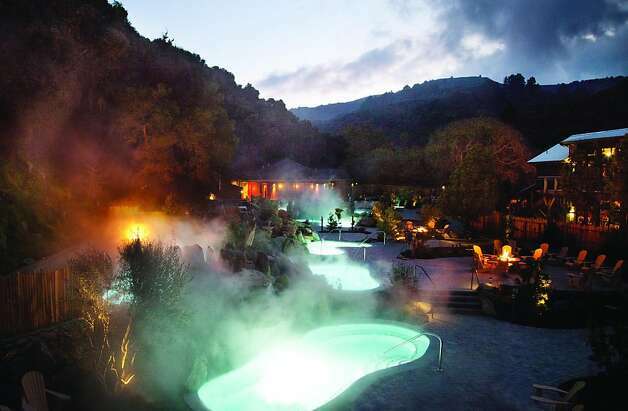 It is similar to a spa in that people visit for relaxation and renewal, but the how is unique. The Refuge Experience consists of cycles of heat, cold, and relaxation. If you do it according to their plan, you heat up for 5 – 10 minutes in a hot tub, sauna, or steam room, immediately cool down in a cold pool for as long as you can stand it (up to 1 minute….I definitely never made it that long), and then relax for at least 15 minutes before starting the cycle over. You are primarily outdoors, surrounded by trees and crystalline pools with waterfalls flowing down the rocks. 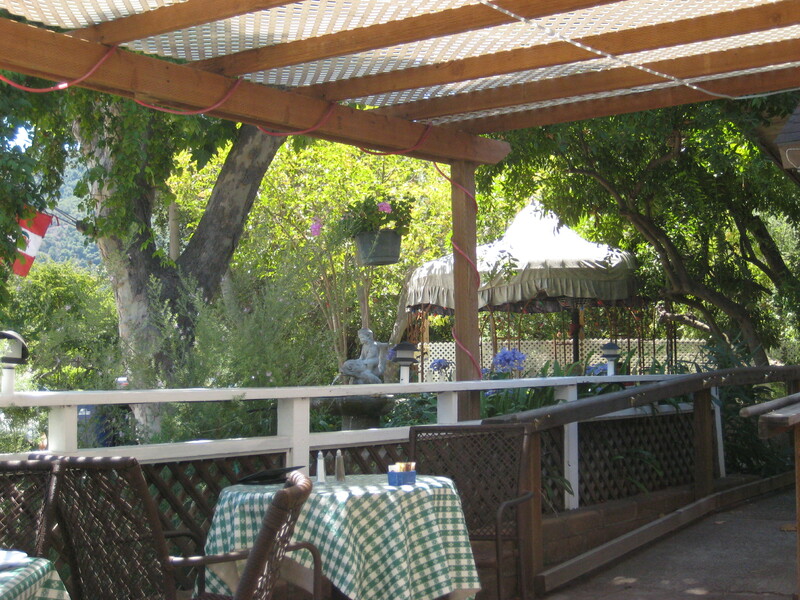 The setting is idyllic and very conducive to relaxation. However, the process itself was at times rather rigorous. Normally, heat and I are good friends, but the sauna and steam room were both much hotter than I was comfortable with, and I couldn’t stand to be in either for long. The steam room was so steamy that I could not see the back upon entering, and the steam was laced with eucalyptus which made it hard for me to breathe. I must admit though, I felt a lot better after sitting in that steam…you know, once I got to the relaxing part. The cold pool was, well, really cold. Actually, I should say the “cool” pool was really cold as I never could get in the 37 degree “cold” pool past my thighs. They wanted full submersion, and at 50 degrees, trying to stay in the cool pool for even 30 seconds was difficult. However, the process did make me feel better after a few rounds, and the relaxing portion was just that. I almost went to sleep more than once, and coming out of the cold makes you feel a lot warmer than I would have expected while you’re relaxing. I tried to do the cycles their way, but after the first hour or two, I started spending large amounts of time in the “warm” pool between cycles. That was truly relaxing. But I do think there is merit to the cycle system because Daniel and I both felt great after. Our skin looked amazing, and for both of us, that is not an experience we often get. Refuge was completely worth the drive and the cost, and I fully intend to go back as frequently as possible. Carmel is a place where I can always find tranquility wherever I look for it, but if you want the ultimate relaxation experience, Refuge is a good place to look.